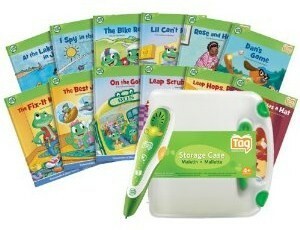 LeapFrog Tag Learn & Love to Read Bundle w/ 13 Books & Case: $47 w/ Free Shipping, Regularly $94! Right now on Amazon, you can get a LeapFrog Tag Learn and Love to Read Bundle for only $47 with free shipping! This set comes with the Tag system, 13 books and a carrying case! This has a list price of $93.99. NOTE: This price is for the green Tag, but the links may bring you to the "pink" Tag, which costs $64.89. If so, just click on the "green" icon on the product page to switch to the correct one.